LCBC Church in Central Pennsylvania approached Link Up Communications with a unique challenge: to recreate the dual screen presentation found at their main campus at their remote locations. The church had previously looked at terrestrial based solutions, but soon realized that these were complex and too expensive. LCBC asked Link Up Communications to come up with a cost-effective satellite solution.. The Link Up team installed a Ku-Band uplink antenna at the site of the main campus in Manheim, designing a system for LCBC that includes individual HD video encoders for both screen shots with 4 stereo audio feeds each. A transport stream multiplexer (mux) was used to combine the outputs of both encoders. 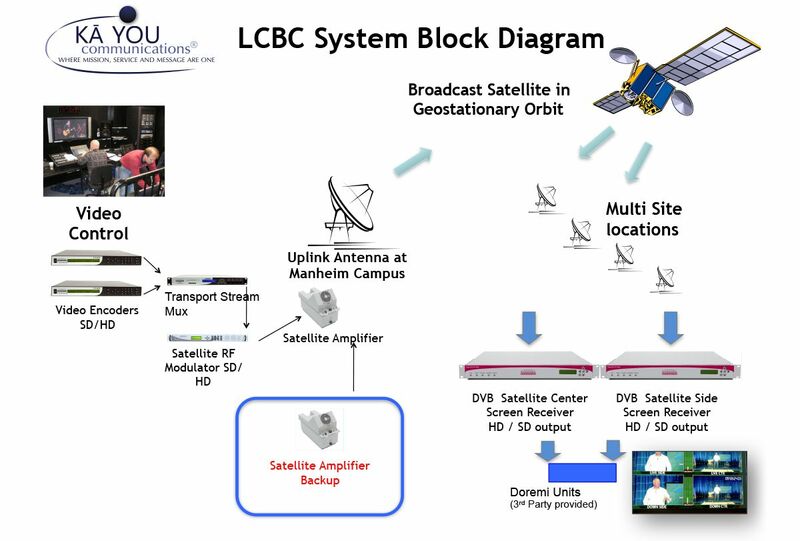 The mux provides a single transmission stream that includes both video feeds and 8 stereo audio feeds to a satellite RF modulator, which drives the satellite uplink’s amplifier to feed the transmission to a geo-synchronous satellite. The satellite receives, converts, and re-transmits the signal back to the Continental US. Upon installation, LCBC’s recording devices were found to need an even tighter specification for the frame synchronization than previously expected. Although the decoders came with “Genlock” as a feature, the HD video recorders used by LCBC required a tighter spec. LCBC needed to not only have a great picture to the projectors, but also the same clarity for potential recording devices. To solve this issue, an additional out-board frame sync generator was added at remote locations. Though it’s a sophisticated system it is extremely reliable, yet simple enough for staff and volunteers to operate. The video quality at LCBC is exceptional; both screens are high definition. LCBC can choose to send video messages live for immediate play, or store them at remote campuses for delayed playback. The flexibility of this system gives their team the convenience of planting a remote campus anywhere. A simple dish, receiver and additional frame sync generator is all that’s needed to feed dual screens.